Sandbox Interactive has just announced that its sandbox MMORPG Albion Online is going free-to-play on April 10, 2019. In case you weren't aware, Albion Online was announced as a free-to-play game before those plans were scrapped in favor of a traditional buy-to-play model. However, I can't say that this move wasn't predictable. As it happens with most MMORPGs nowadays, as soon as your player base significantly declines (Steam info only, which can be misleading, as the official game stats show) the barrier of entry is removed (the price) and more players are free to join the game and be tempted by the alluring items available in the cash shop. 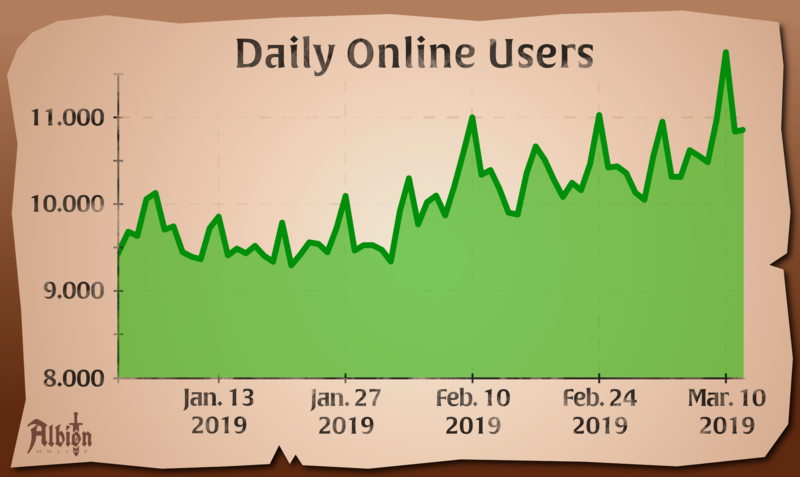 Sandbox Interactive mentions that Albion Online is doing “very well” and the will to open up the game to more players, something that makes absolute sense. The developers state that there are no gameplay restrictions for free accounts, but you can purchase Premium status with real money or in-game currency. Veteran Albion Online players, also known as those who paid up for the game, will get a Specter Wolf mount as a thank you. But wait, there's more! A ten-day Fame boost from April 1 to April 10, a 25% boost to all Fame earned through in-game activities, 1,000 Gold and three days of Premium. Albion Online is an unconventional, old-school MMORPG with a player-driven economy and a classless system, and it is a good thing that it is going free-to-play. The team has a lot planned for its future, including a larger variety of randomized dungeon content, improved faction warfare and much more.